"Mississippi River Fish Advisories, PCB Reports"
"Fishing and Eating are Great Along the Great River Road!" Can I safely eat the fish? Flying Carp and Swimming Eagles! Author Note: Stories about Alligator Gar in the southern Mississippi River (I started hearing them in Tennessee) were among my favorites while I was researching for Volume 3 (The Lower Mississippi). "The Mississippi is home to many fantastic species. What draws me to the river is the prehistoric gar. Perhaps other readers of your site would be interested in the Gar Anglers' Sporting Society web pages. If you deem our site worthy, could you provide a link? Pete's encounter with an Alligator Gar! "When the fish started to tire and our pace slowed to a crawl, Pete began to edge him toward a sand bar on the inside of the bend in the river where we had started. He slowly pulled and manipulated until the monster, all six feet nine inches and one hundred sixty pounds of him, was grounded in the shallow water. Over the years, most of those I saw weighed in at right around 200 pounds!" Click here to read about FLYING ASIAN CARP: our newest exotic species...at least it is edible! Click on the thumbnail to see a large version of these Alligator Gar! "But can I eat the fish?" "What fish can I safely eat?" "I'll eat any fish that comes out of the River." These are questions and comments frequently heard regarding pollution and fish in the Mississippi River. The extremes range from the excessively cautious "not eating any fish" to the reckless "eating all fish." Reality lies somewhere in between. Some fish in the river may take in contaminants from the water they live in and the food they eat. Some of these contaminants build up in the fish - and you - over time. In both Minnesota and Wisconsin, the Department of Natural Resources in conjunction with the Division of Health issue fish consumption advisories that include the Mississippi River. These are developed to help you plan what fish to keep as well as how often and how much sport fish to eat. In Wisconsin, copies of the Health Guide are available at any DNR office. The main contaminant found in the Mississippi River is PCBs (polychiorinated biphenyls). PCBs, were once used in such products as electrical transformers, cutting oils and carbonless paper and hydraulic fluid. Although banned in 1976, PCBs do not decompose easily and, therefore, remain in the environment. PCBs accumulate in sediments at the bottom of the river. Fish can absorb the PCBs from the water, suspended sediments or food. The good news is that the levels of PCBs in the Mississippi River are slowly decreasing because the PCBs already in the sediment are being buried as the river deposits new clean sediment. PCBs are a health concern because they are suspected to be cancer causing, and research has shown they impair reproduction in some animals. PCB's have also been linked to developmental and growth problems in children born to women who regularly ate Great Lakes fish. The amount of PCBs in a fish taken out of the Mississippi River is dependent upon many factors. The kind of fish, its size, age, fat content, diet and location all can influence the amount of PCBs. Usually older and larger fish of the same species will have a greater amount of PCBs. Fish from Pools 3 and 4, which extends from Hastings, MN though Lake Pepin, will have more PCBs than fish from pools downstream. PCBs are stored in fat; therefore, a fish with higher fat content such as a carp would likely contain higher concentrations of PCBs than a smaller, leaner species such as a perch. The Health Guide has information about which fish should be avoided. The guide lists species, sizes and locations. 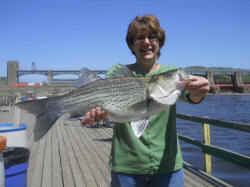 A person can take steps to avoid exposure to PCBs and still eat fish from the Mississippi River. Eat smaller, leaner fish. Eat fish that are less contaminated (panfish usually contain low or undetectable PCB levels), and remove all traces of fat and skin before cooking. If you are pregnant, nursing an infant or under 15, avoid eating some fish as listed in the Health Guide. There are some differences between the fish advisories listed in the Health Guides for the two states, but in general the recommendations are similar. In the past Minnesota treated the Mississippi River as one unit from St. Anthony Falls, near the Twin cities, to the Iowa border, consequently there were more extensive health warnings for fish consumption. This year, Minnesota breaks the Mississippi River into five units. (Wisconsin breaks the river into three units.) The differences in the guides may be a result of differences in how health risks are interpreted, according to the Minnesota Fish Consumption Advisory. 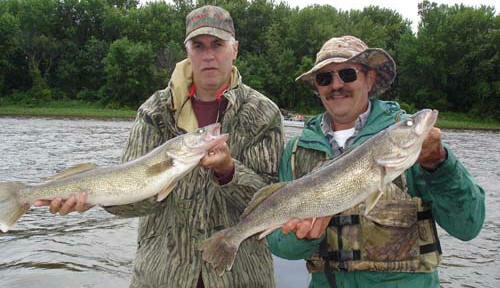 Channel catfish and walleye larger than 20" should not be eaten more than one meal a month. Interested in sponsoring this or another feature story on greatriver.com? Please phone 608-457-2734.